Becnel's Automotive Repair offers all the services you need to repair, maintain, or improve the performance of your vehicle. The state of Louisiana requires vehicles to undergo a yearly brake tag inspection in the parish it is registered in. Becnel's Automotive Repair offers these inspections and provides you with a detailed report whether or not your vehicle passes or fails the tests. When you arrive for the inspection, please have your vehicle registration, proof of insurance, driver’s license, and inspection fee ready. You will then fill out an application and be asked to follow simple instructions throughout the inspection. As long as your vehicle passes, you will be issued an inspections sticker. If it fails, you will have 30 days to correct the problem, which we can do for you in our auto repair shop. From the function of the speedometer and odometer to all brake components, the lighting system, and many other areas, our thorough inspections and repairs will get your car back up to speed. When something just isn’t right with your vehicle, but you don’t know what the problem is, Becnel's Automotive Repair’s diagnostic scans will shed light on the needed repairs. We will connect your car to an advanced digital scan machine and provide a detailed report on what we find. Then our mechanic team will inform you of the next steps and schedule an appointment to complete the repairs your car needs. The scan only takes a few minutes. Sometimes, a small fix is all that’s needed and we may be able to get it done the same day. Our New Orleans auto repair shop provides full brake services for cars, trucks, SUVs, and commercial vehicles. Whether you need new brake pads for the front, rear, or all four brakes, replacement rotors, a new line, or complete overhaul of your brake system, we’ve got you covered. From scheduled maintenance to emergency brake repairs, our staff will ensure your safety and peace of mind when you’re on the road. There are possible reasons why your car will not start. If the car is silent or only clicks when you attempt to start your vehicle, a dead or corroded battery or faulty alternator may be the problem. When a vehicle turns over but doesn’t start, the fuel injection system or spark plugs may need repair. Other common issues with starting your car include the engine starting but then cutting off, missing while idling or accelerating, or refusing to start in cold or wet weather. Becnel's Automotive Repair has experience with all of these problems and will get your vehicle running again, going over a detailed estimate and following up with a service appointment. Becnel’s Automotive Repair also services any vehicle’s air conditioning and heat, keeping you cool in the summer and warm in the winter. From simple repairs such as a coolant refill or hose leak to complex repairs such as the replacing the compressor or the entire system, our mechanics can get the repairs done quickly. For transmission fluid replacement to resealing, clutch repairs for manual systems, and much more, we fully service transmissions for any make and model. We remove your transmission, disassemble it to find the problem, and reinstall it, advising replacement of large and small parts where needed. Whether the problem is obvious or the check engine light came on and you aren’t sure why, we can help. 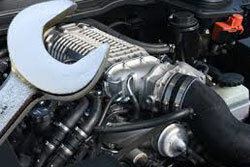 Bring your car to our New Orleans auto shop to get any engine service done. If you’re experiencing a knocking or tapping noise, or your engine stalls, our mechanics will determine what’s going on under the hood. We also provide any engine maintenance service you need and offer products for performance upgrades as requested. We also provide wheel alignments through advanced digital machinery and the meticulous work of our auto technicians. Running into potholes and other rough road conditions contribute to misalignment of your tires and wheels. Becnel's Automotive Repair will take care of your alignment problem quickly and efficiently. Is your car stalling frequently, running roughly while idling or accelerating, or starting with difficulty? Your vehicle probably needs a tune-up. We provide complete tune-ups and numerous maintenance services including oil changes and fluid flushes. We also service your engine and suspension, maintain your exhaust system, refill your air conditioning unit’s coolant, and offer other specific services that apply to your vehicle. Becnel's Automotive Repair also repairs and services commercial vehicle fleets including groups of cars, forklifts, pickup trucks, commercial use vehicles, limousines, and dump trucks. Our large inventory of parts and extensive resources to order additional parts ensures we can get the job done. Contact us for additional details.